Small and simple events in life suffice to make us happy, and it is a good thing. Being contacted by Kristina, an editor from Design Sponge, was one. Their website is eye-candy… a wonderful trove of design ideas. “One of their editors wants to feature my blog on their site,” I told P. excitingly only a few minutes after I received Kristina’s email. I mean, how funny it was for me to think about it when I acknowledged to Kristina that I was in fact a huge fan of Design Sponge. Kristina asked for one original recipe. I gave her two: I was just too excited. In fact, I chose to share what is my typical lunch fare — soup and mini cakes. But if you have been following me in my kitchen, you already know this. 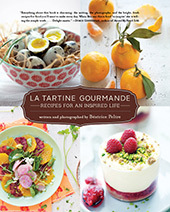 If you are interested in seeing the recipes, check for the full article by following this link. 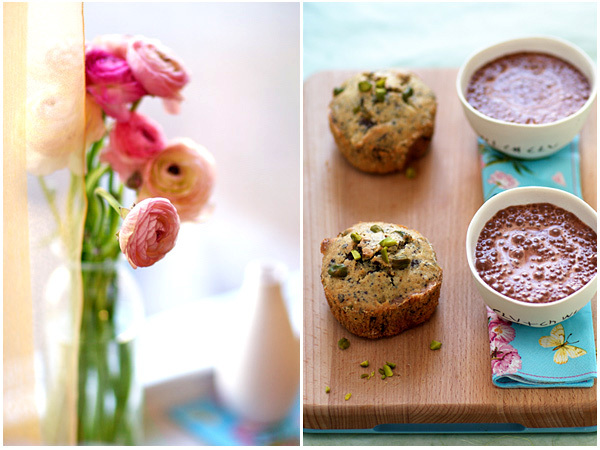 The recipes are the Dark Chocolate Pistachio and Nut Muffin I had already showed you some time ago, and a two vegetable bicolor soup. 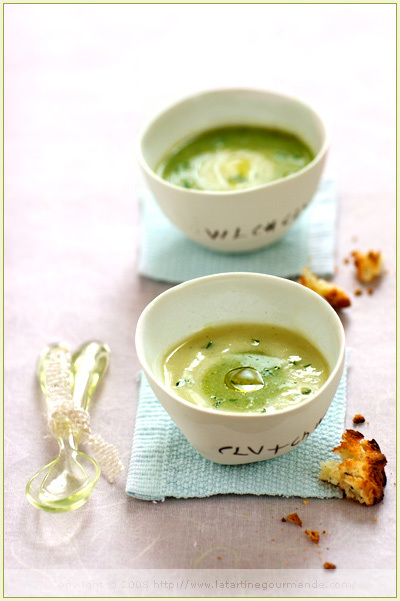 When you cannot choose one vegetable in your soup, why not have two instead, and eat them together in the same bowl? 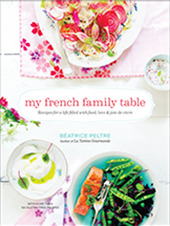 Many thanks to Kristina and Design Sponge again for this super chouette honor and the great write-up! They made my day! Have a nice week-end everyone! A la semaine prochaine ! *These can be found in organic stores; they can also be substituted for all-purpose flour. Grease six muffin molds, or paper molds. Chop the chocolate coarsely; set aside. Chop the pistachios and pecans coarsely; set aside. If you have a stand mixer, place the butter and sugar in the bowl and work until the batter is smooth and creamy, light in color (or do it by hand). Add the eggs, one by one, waiting that the previous one is well incorporated before adding the next. Add the milk and mix. Fold in the chocolate, nuts and poppy seeds. Divide the batter between the molds, about 3/4 full each. These muffins keep for a few days but are even better eaten the first day. Prepare the two soups following the same steps. Take a large thick-bottomed pot and heat the oil on medium heat. Add the shallot and cook without browning (about 1 min). Add the chopped vegetables and cook for 5 min on medium to low heat. Cover with broth or water. Simmer covered for 20 min, until fork tender. Stop the heat and mix with a blender. Add the cream and mix. Season with salt and pepper, to taste. To serve, place a small ring mold inside a soup bowl and pour one soup outside the ring, the other inside. Remove the ring. Serve with freshly chopped parsley, a dash of olive oil and fleur de sel sprinkled on top. Accompany with tartines (slices of whole grain bread with various toppings of your choice, equivalent to open faced sandwiches). Oh I do wish I could have that for dinner tonight. That would be perfect for one tonight. Congratulations on the write up! It’s a grand article! I just adore your blog and have found it inspirational! I always covet your cooking pans and wee pots (as above) and can never find them. It would be really thrilling if you’d post your sources, well, any in North America or web-accessible. I realize you get a lot of your equipment in France. love your photos, so bright and cheery! C’est fou comme une belle photo peut magnifier le sujet. Ce chocolat il ne lui manque que l’arôme. Great! Your pictures are always breathtakingly beautiful and colorful! That is fantastic. I am a huge fan of Design Sponge also so I’m excited to hear that you will be featured there! You so deserve it! En voilà un super projet! design sponge is a great site…glad I found it thru your blog. And your blog so fits the website…very stylish and beautiful. I was SO excited to see this on Design Sponge–two of my favorite sites, united! You are so stylish! I’m happy for you Bea! You trully deserve it! Bea, it is your site that’s eye candy! and where do you get your cute spoons? are they glass? C’est juste completment craquant, pas seulement la mousse sur le chocolat, mais les renoncules, tout quoi. I saw you there, Bea! It’s a beautiful participation. Ooh Design Sponge and Bea! Perfect combination. Hands down. It was a great write up indeed! I too love their site and style. The mini cakes look great! This is such a beautiful blog, a feast for the eyes. I don’t have time to look at everything. But I really feel I must up the ante with my own presentation – mouthwatering! Oh Design Sponge is so nice and pretty. Congratulations Bea, you and Design Sponge are absolutely fitting! Many many thanks everyone. I really felt honored to be up there. I really dig Design Sponge! You have some of the most beautiful photos on the net. Wonderful and inspiring!! Ce n’est pas très original, mais je suis en extase devant ces photos. Quelle lumière. Quelles couleurs. Bravo pour ce bel article chez Design Sponge. I like your new template picture :), very pretty! I know this is an old post…. BUT I tried them yesterday and I absolutely LOVE them 🙂 The texture with all those nuts and hidden chocolate surprises is amazing. 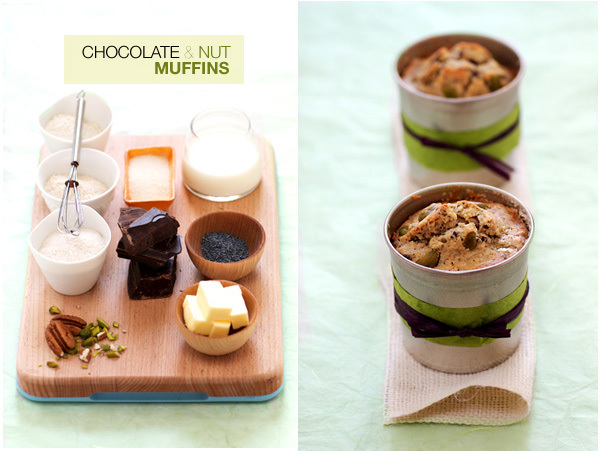 I thought no muffin could compare to the hazlenut, banana, chocolate ones from your cookbook, but I was wrong….